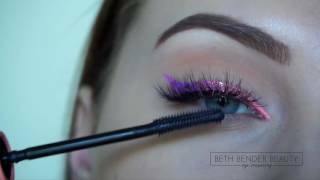 - Precise eyeliner and eye makeup in just a few minutes. - Create seamless gradient and rainbow makeup looks with ease. - Allows you to create beautiful eye makeup styles, anywhere, anytime. Your Pro Pack Eye Candy Eyeliner Stencils come with 30 complete eyeliner sets (60 pieces total). All Eye Candy Gentle Adhesive Eyeliner Stencils should only be applied to dry eyelids and skin, especially around the eye area to prevent any irritation or redness when putting on and taking off your stencils. To use your Eye Candy eyeliner stencils start first by tearing away the perforated piece located on your stencil sheet as seen in image 1 below. When removed both round edges on your left and right eyeliner stencil shapes will be ready to use. You can put the perforated piece aside to place your used stencil back on once your eyeliner has been created. Peel off one of your eyeliner stencils at the outer rounded edge and remove it completely from sheet. 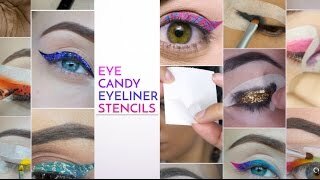 Carefully begin placing your Eye Candy eyeliner stencil over your eyelid. Depending on preference your eye can be open or closed when placing your eyeliner stencil along your lid. Make sure the top arm of your Eye Candy eyeliner stencil lays comfortably along your top eyelid and the bottom arm of your eyeliner stencil lays flat under your bottom lash line as seen in images 2 and 3. Both should be firm against your eyelids, top and bottom. Repeat the same steps for the opposite eye. For a perfect application make sure there are no gaps or air bubbles before applying your color. For the best results both eyeliner stencils should be applied to both eyes first before adding any color. Begin applying your eye color. When using a powder shadow, make sure to tap off any excess color from your brush to prevent fall out. Starting at the tip of your wing point as seen in image 4 and working your way down towards the inner corner of eye. Fill in the entire area of your eyeliner stencil, especially when using a gel or a liquid liner. Once both eyes have been filled in, now is the time to peel away your eyeliner stencils and reveal your perfect eyeliner! 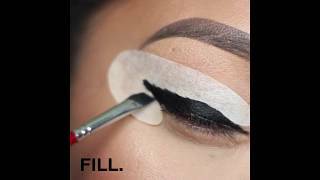 Starting from the outer round corner as seen in image 5, carefully begin peeling away your eyeliner stencil towards the inner part of your eye until it is completely removed. Enjoy your perfect Eye Candy eyeliner! PRO TIPS: Our Eye Candy Gentle Adhesive Eyeliner Stencils are made from a hypoallergenic material and can be used with powder eyeshadow (wet and dry), liquid, gel, cream, pencil, and even glitter formula’s to create endless eyeliner and eye makeup looks. They fit any eye shape and eye size and are easy to use. For creating a thicker, more dramatic eyeliner effect, place the point of your eyeliner stencil slightly higher on your eyelid. For a classic cat eyeliner look, place the point of your eyeliner stencil closer to your lash line. To avoid fall out especially when using a powder shadow, be sure to tap off your brush before applying any color to your eyelids. 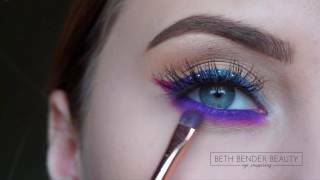 GRADIENT EYELINER: For a gradient eyeliner look apply your color in sections (one color slightly overlapping the one before) and move your brush or eye makeup applicator down your eyelid. 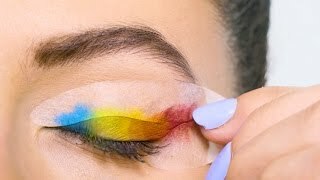 Use as many eye colors as you like until your Eye Candy eyeliner stencil shape in filled in and there are no areas within your eyeliner shape that are missing color. POLKA DOTS: For creating a polka dot effect, start first by applying your Eye Candy eyeliner stencils to your eyelids and adding a base color. The base color should be in contrast to whatever color polka dots you apply. Next, using either a liquid or a gel liner begin adding your polka dots. You can do more than one color if you desire. To continue a clean and hygienic makeup routine we recommend NOT sharing your used adhesive eyeliner stencils. You can protect your Eye Candy Gentle Adhesive Eyeliner Stencils by keeping them in the original packaging. This will also help to prevent exposure to heat and ensure the perfect eyeliner application every time. SO HAPPY THESE ARE BACK!!!!!! I never knew how much I needed these stencils until I bought them, fell in LOVE and then they sold out :( Absolutely worth the purchase! if you're interested in creating any thickness eyeliner, and really cool eyeliner looks then this is the product for you! you NEED these eyeliner stencils! Hi, I am fair skin toned and I have hand shakes. You girls can imagine the mess I make with liners and shadows. I bought this product and I have a professional look with sharp clean lines no matter the colour I choose to apply. Buy this product, it's as good as they say it is.